Lawmakers have struck their first bicameral deal for a fiscal 2019 funding bill, which would set line-by-line appropriations for a handful of agencies, including the Energy and Veterans Affairs departments, as well as the legislative branch. While the bill is generally viewed as non-controversial, lawmakers included certain restrictions on the Trump administration’s plans to reorganize government. Many of the 32 proposals the White House issued in June have received bipartisan pushback, but the spending package—known as the first “minibus” for fiscal 2019—marks the first effort legislators have taken to formally block those proposals from moving forward. The minibus includes funding for the Army Corps of Engineers, providing the agency with an 11 percent increase and its highest ever appropriation. The White House had proposed reorganizing the Corps to strip the agency of the primary functions of its Civil Works division. The plan would have shifted navigation functions to the Transportation Department, and flood and storm damage reduction, aquatic ecosystem restoration, regulatory and other responsibilities to the Interior Department. Lawmakers, however, nipped the proposal in the bud, using language that augurs poorly for other elements of the reorganization proposals. They similarly nixed a previously announced proposal that the White House included in its reorganization plan to fold an Energy Department office into the secretary’s direct purview. The reform “centralizes staff and resources” with expertise on the department’s international efforts, the administration said. The appropriators rejected the consolidation. Lawmakers also blocked a proposal from the Defense Nuclear Facilities Safety Board to reorganize itself, including by slashing its headquarters staff by 46 percent. The conferees specifically prohibited that plan unless it is authorized by law. The proposal was not included in Trump’s reorganization, however, and it was announced by the board's acting chairman, Bruce Hamilton, who was appointed by President Obama. The Trump administration had proposed folding the various “applied energy” functions into a single Office of Energy Innovation. The current structure, which divides the functions by categories such as nuclear, fossil, and renewables, creates a system in which the government is “picking energy technology winners and losers and pitting fuel types against one another,” the White House said. The conference report did not directly address this suggestion, but a Democratic appropriations aide said the conferees did not view it as a “serious proposal” and that Energy is not moving forward with it anyway, so they did not bother to block it. Prior to the report’s release, lawmakers took preemptive steps to ensure the Trump administration did not move forward unilaterally with its reorganization plans. In a fiscal 2018 omnibus spending bill, lawmakers placed restrictions on reorganization efforts at the Justice, Commerce, Agriculture, Education and State departments, as well as the Environmental Protection Agency. Office of Management and Budget Deputy Director for Management Margaret Weichert has testified to Congress that 10 to 12 of the White House’s proposals would not require congressional approval, though the White House hasn't clarified what those are. The administration is already moving forward with at least one proposal, namely merging the Office of Personnel Management's Human Resources Solutions division with the General Services Administration. 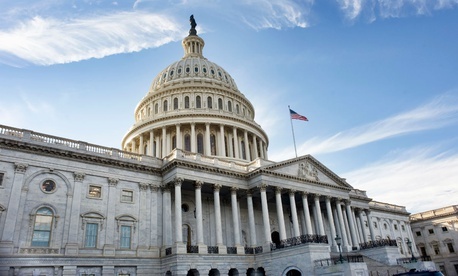 Both the House and Senate included in their fiscal 2019 appropriations bills provisions to block unilateral efforts to reshape OPM, GSA and other agencies covered in the general government spending measure. The spending package including that measure is going to conference on Thursday. Senate spending bills setting fiscal 2019 funding for the Labor, Health and Human Services and Education departments require the administration to receive approval from the House and Senate before it moves money around to pay for any reorganization. The upper chamber also voted to place restrictions on proposed reform efforts at the Interior Department and EPA.